As their relationship grows, Lucette's obsession with ventriloquism and her dummy Hugo starts to strain her relationship with Jace. To Lucette Hugo is more than just a dummy, he's her best friend and represents her ambition as an artist, to her, he's very much real. But to Jace, Hugo is just a puppet, or is he? The subgenre of creepy dolls is a favourite of mine in horror movies but recent contributions such as Annabelle and The Boy have left me less than impressed. 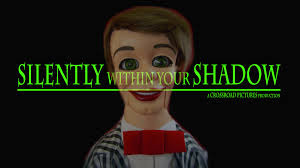 With Silently Within Your Shadow Scott Lyus has brought us back to the days when a creepy atmospheric tone was priority over the jump scare. I particularly liked Scott's use of lighting when shooting the film. I felt the script was well written, yes you knew where it was going but that did not stop you enjoying this unnerving tale of obsession and manipulation. And of course it was a brilliant achievement to have horror icon Bill Moseley as the voice if Hugo. A very good short and I look forward to seeing what's next from Scott Lyus.